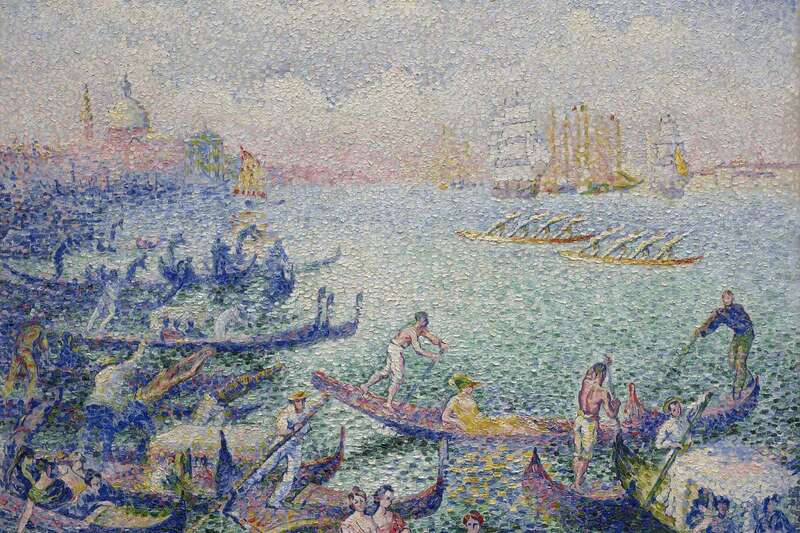 Henri Edmond Cross' painting "Regatta in Venice" was given to the Museum of Fine Arts, Houston in 1958 by Oveta Culp Hobby. The heirs of a major French art collector whose possessions were plundered by Nazi forces during World War II have filed a claim of ownership for an Impressionist painting that has belonged to the Museum of Fine Arts, Houston for about 60 years. Henri-Edmond Cross’ 29-by-36-inch canvas “Regatta in Venice” is on loan to the Museum Barberini in Potsdam, Germany, where it is on view through Feb. 17 in “Color and Light,” a major retrospective for the French artist. The Washington Principles on Nazi-Confiscated Art were established about 20 years ago, when art experts from 44 countries agreed to adopt “just and fair solutions” to help Holocaust survivors and their heirs receive restitution for the approximately 600,000 works of art stolen from Jews by Hitler’s forces, many of which disappeared or landed in public and private collections around the world. About 30,000 Nazi-looted works are known to have ended up in American institutions. The 179-member American Alliance of Museums operates an online portal for potential claimants; and the Houston museum, a member of that organization, was was well-aware that “Regatta in Venice” was stolen. The back side of the frame bears a telltale, numbered inventory tag — “MAB 1085” — from the Reichsleiter Rosenberg Taskforce, a Nazi party organization that confiscated valuable property. Levy’s heirs were not aware of the painting until they saw it in Potsdam, Partsch said. Their claim was first reported Wednesday by the German daily BILD. Levy died in 1977. Partsch said the collector’s grandchildren, who live in Europe and do not want to be identified, have recovered some of their family’s lost works. Last year they received two paintings — one by Pissarro and one by Cross’ colleague Paul Signac — that bear the Nazi inventory numbers 1082 and 1084. But whether Levy also owned “Regatta in Venice” and how it came to the U.S. are not yet clear. Another label on the back of the canvas, which identifies the painting as “Carnaval Venice,” suggests it was exhibited and sold by Pierre Matisse Gallery, a well-respected New York dealer. Philanthropist Oveta Culp Hobby purchased the painting in 1954 and gave it to the Houston museum in 1958. Partsch contended that the politically active Hobby would have recognized the significance of the MAB label, and he questioned the authenticity of the New York label. “Everybody knew it was stolen,” he said of the painting. Cross, who died in 1910, reveled in the light of the French Riviera and helped to shape the late 19th century’s Neo-Impressionist movement — known mostly for its pointilist technique and influence on the next generation’s Henri Matisse. With a pointilist vision of blues, greens and creams, “Regatta in Venice” depicts a crowd of leisurely boaters against a dimmer backdrop of the Venetian skyline and larger sailboats. Compared to more dynamic, vibrant canvases by Cross in the Barberini’s retrospective, it appears to be a relatively minor painting. The MFAH has not exhibited “Regatta in Venice” in Houston since 1996.